The SIRUI 3T-35 Table Top Tripod Kit is an ultra-compact, rugged, portable, flexible table top tripod…and much more! At only 9.5 inches closed, it can easily fit in a camera bag, backpack or back pocket. It can even fit in you glove compartment! The SIRUI 3T-35 is made of forged aircraft grade aluminum alloy, so it’s rugged and built to last! It’s large, stable support legs can hold digital and video cameras weighing up to 8.8lbs. And the two-section center column can extend to 13.5 inches! Ideal for videos, selfies, overhead shots or just letting you get into the shot with your friends or family, the 3T-35 is a winner! Available in eye-catching RED or classic Black. And at only $64.94 (including ball head and Arca-compatible Quick Release plate), they can fit anyones budget. There’s always room for a SIRUI T-005X Travel Tripod Kit in your bag or backpack! It folds down to only 12.2″, opens up to 54.5″, is surprisingly lightweight, ruggedly constructed and stylish! 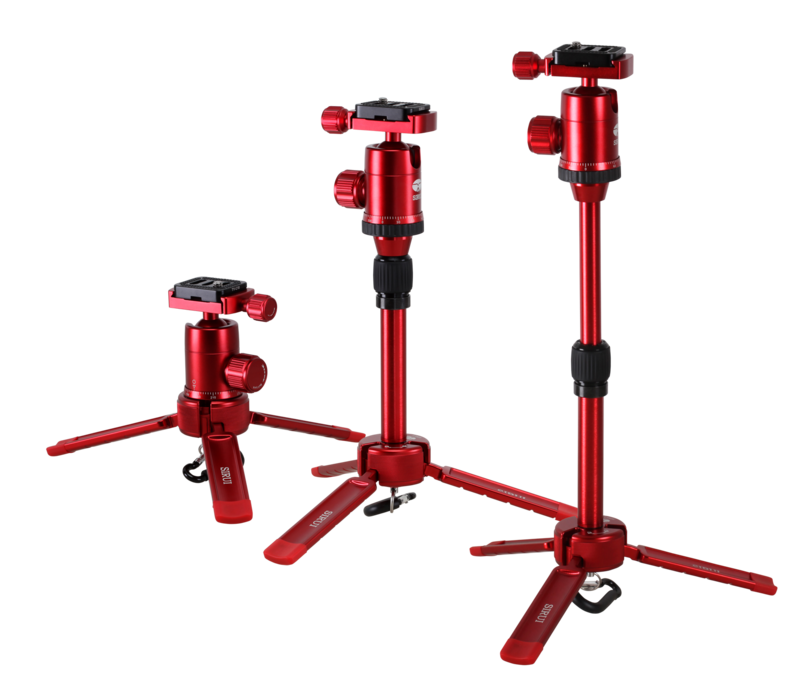 The aluminum T-005X comes in Red, Blue or Black, weighs only 2.3lb including C-10S ball head (with Arca-compatible QR plate) and holds 8.8lb! Need to save some ounces and hold heavier equipment? The Sirui T-025X 8-layer Carbon Fiber kit weighs only 2.0 lb with ball head and holds an impressive 13.2lb! 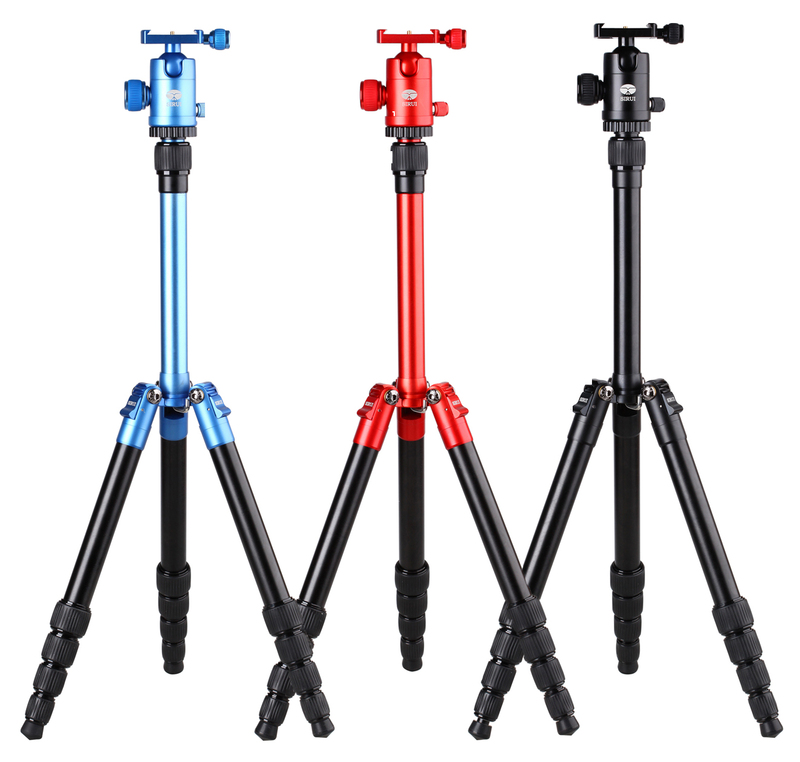 If you want the ultra-compact features of the SIRUI T-005X in a tripod kit that can handle a larger camera/lens outfit, take a look at the new Sirui T-004X Tripod Kit (they come in Red, Blue or Black). It’s taller height, wider stance, adjustable center column and short center column gives you even more flexibility! And it also comes in Carbon Fiber for just $234.94 (only $100 more than the aluminum version)! Now’s the perfect time to buy that travel photographer a tripod that is always there when they need it. Easy to carry and setup, rugged, reliable and lightweight. To see more details on the SIRUI 3T-35 go to http://www.sirui.com/sirui-3t-series-tripod.html. For the T-0X series Tripod Kits, go to http://www.sirui.com/sirui-t-0x-series.html. This entry was posted in ball head, gift, Photographic Equipment, Sirui, tripod. Bookmark the permalink.